Rembetlka Roads – A visit to Syros/Markos Vamavakarls and others – Issue 309. 2009. Slack Key Ladles – Cindy Combs/Owana Salazar/ Brlttnl Palva – Issue 302/303. 2008. Steve Blundell – Guitars For Timor – Issue 234. p. 17/18. Garry Lucas – Guitar Heaven – Issue 230/31. p. 32/33. Maltese Australians – ‘Another Ghana’ – Issue 223. p.43/45/47. 2002. Seaman Dan – ‘Torres Traders’ – Issue 222.p. 43/54. 2001. Prof. Margaret Kartoml – ‘Tales From Timor’ – Issue 213. p. 28/29/31. 2001. Lukas Ligeti -‘Looking Ahead’- Issue 204. p.39/41. 2000. Australian Festivals – ‘Ozfest Heaven’ – Issue 199. p.43/54. 2000. Dennls Kamakahl – ‘Biker Slack’ – Issue 198. p. 41/43. 1999. Del Rey- ‘Thunk v. Sustain’ – Issue 198. p.17/18. 1999. Freddie Roulette – ‘Ready Freddie’ – Issue 196. p. 19/20. 1999. Bremen sacred Music Festival – ‘Time & Emotion’ – Issue 194. p.57/59. 1999. Xylouris Ensemble – ‘Crete Away’ – Issue 192. p. 41/43. 1999. Krlstlna Olsen / Peter Grayling – ‘Songs & Cellos’ – Issue 190. p.55/57. 1999. Cyril Lefebvre – ‘Pataphysical’ – Issue 190. p. 47/48/49. 1999. Ledward Kaapana – ‘Pieces of Led’- Issue 187. p. 39/41. 1999. Christopher Roberts – ‘Betel Mania’ – Issue 184. p. 31/33/35. 1998. Kealoha Beamer – ‘Keeping It SlacK’ – Issue 178. p. 51/53. 1998. Bob Brozman – ‘Bobbing Around’ – Issue 178. p. 45/47/49. 1998. Steve Feld -‘Hearing Voices’ -Issue 174. p.33/34. 1997. George Telek – ‘Papua Pop’ – Issue 173. p.19/20. 1997. Kavisha Mazzella – The Catalyst’ – Issue 172. p. 49/51. 1997. Elena Ledda – ‘Out Of The Med.’- Issue 167. p.16. 1997. The Backsliders – ‘Backsliding Away’ – Issue 166. p. 19/21. 1997. Novalia – ‘The Italian Dub’ – Issue 163. p.14. 1997. George Wlnston – ‘The Dancing cat’ – Issue 162. p. 20/21. 1996. Rembetlka Compania – ‘Greeks Abroad’ – Issue 162. p.27/29. 1996. Daniele Sepe – ‘Naples Diet’ – Issue 161. p.20/21. 1996. Richard Hoopii – ‘Hawaii Times’ – Issue153. p. 25/27. 1996. Phil Manning – ‘Man In Shed’ – Issue 151. p.17. 1996. Mr. Cassldy – Cassldy’s National’ – Issue 149. p.19. 1995. Stacey Phllllps – ‘Book Of Slides’ – Issue 146. p. 18/21. 1995. Trnava Dobro Festival – ‘Siovak Steel’ – Issue 139. p.18/19. 1995. Ray Kane – ‘Beach Guitar’ – Issue 138. p.19/21. 1994. Kevln Connolly – ‘When In Rome’ – Issue 127. p. 63/65. 1994. Mau Mau – ‘Turin Party’ – Issue 125. p. 25/27. 1993. Ry Cooder – ‘Brothers In Paradise’ – Issue 117. p. 33/34/37. 1992. Pahinui Brothers – ‘Brothers In Paradise – Issue 117. p.33/34/37. 1992. Hawaiian Slack Key Guitar – ‘Get Slack’ – Issue 113. p.27/29. 1992. Flo et Douce’in – ‘Flow Charts’ – Issue 111. p. 17/19. 1992. Sammy Mitchell Snr. – ‘Sammy Days’ – Issue 108. p.17/18. 1992. Bob Brozman – ‘It’s A Steel’ – Issue 88. p.21/23/25. 1990. East German Tour Diary – ‘When East was East’ – Issue 82. p.21/22. 1990. Kealoha Ufe – ‘A Man Of Steel’ – Issue 79. p. 41/43/44. 1990. 100 years of Hawaiian Guitar – ‘Steel Centenary’ Issue 76. p.31/33. 1989. Stella Chiweshe – ‘Star Of The Mbira’ – Issue 48. p. 29/30. 1987. World Music (Italy) – Il Prima Boom Della World Music – Hawaii (part one) – p.26-30- Issue 58-2003. World Music (Italy) – Il Prima Boom Dalla World Music – Hawaii (part two) – p.11-14- Issue 59-2003. Il Manifesto/Alias – ‘Mai Dire Hawaii.’ p.18-22 – 10th August 2002. Italy. 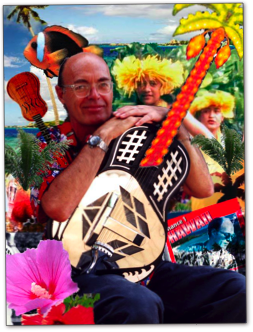 Rough Guide To World Music – ‘Hawaii’ chapter – pages 648 to 652 first edition 1994. Revised 2nd edition – pages 56 to 62- published 2000. Hawaii, Potsdam, Johann Strauss Jnr ., Henry Berger – Welt Musik/Musikblatt – Issue 141 Nov. 1990.